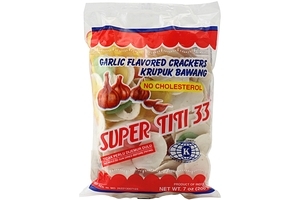 Komodo Super Titi 33 Garlic Flavored Crackers Assorted Color (Kerupuk Bawang Warna) in 7oz (200g) pack. No need to Sun Dried. Frying Required. Can be cooked in Microwave. No Cholesterol. Product of Indonesia. Halal Certified حلال . Kerupuk bawang Super Titi 33 tidak perlu di jemur dulu, bisa langsung di goreng atau di Microwave. Tidak ber kolestrol. [6 units] Limit 2 per customer! Ethnicity: Asian, Chinese, European, Filipino, Indonesian, Japanese, Korean, Malaysian, Singaporean, Spanish, Taiwanese.. Important Information: Product information accessed through this website is obtained from claims made by the products' manufacturers on its labels. Please note that, on occasion manufacturers may alter their labels, thus we cannot guarantee or ensure the accuracy, completeness, and/or timeliness of any product information. We recommend that you do not rely solely on the information presented on our website and that you always read the label carefully before using or consuming a product to obtain the most accurate information. If you have specific nutrition or dietary concerns or questions about a product, please consult the product's label and/or contact the manufacturer directly. We assume no liability for any inaccuracies or misstatements about product information listed on our website. Picture & Presentation: The actual packaging on the products you receive may be different from what you see on the website. We will try our best to up date the most accurate picture. However, we can assure you the content, ingredient, size and weight will be the same as what we present on the website. Additional items placed with product are for presentation only and will not come with the actual product that is ordered, we will not assume liability for miss presentation on the product sold. Should any customer have any questions pertaining to an image on any of the products presented on the website, feel free to contact support@efooddepot.com. Heat Sensitive: Chocolate covered products or products made of chocolate will melt at around 98 degrees. Transit during the summer time might melt the chocolate; however it does not affect the edibility of the products. A helpful tip is to let the product cool down to room temperature for 2 hours before consuming it. Efooddepot.com will not assume any liability shall the product(s) melt, stick together, and/or not retain its original shape. Calpis Calpico (Mango Flavor) - 16.9fl oz.